If one were to compare it to gin, it would sit squarely next to Hendrick's which is distilled with, of all things, cucumbers that, contrary to what one might think, do not make it taste like a cucumber but simply intensifies the distinct taste gin, as a category, already has. It's our new favorite vodka. Now if we could only find a store around here that sold the stuff. I agree, someone gave me a bottle of this for my birthday last week and told me to taste it and I love it. 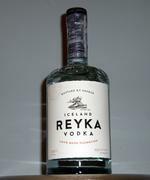 It doesn't taste watered down like the other crazy expensive vodkas and doesn't taste like rubbing alcahol like others. Good job to the creative team that worked on this campaign. Plus, the blond in that add is pretty damn hot.